These did not come out how I expected. They were salty for some reason (and the recipe does not call for salt), so I assume it was the brand of biscuit mix I used (damn generic brands!). They also were not terribly sweet. I opted not to use the lemon icing because I made these for breakfast, and something about icing says "cupcake-ish" to me. At least the texture was nice: moist, soft, muffin-y on the inside, biscuit-y on the outside, not too greasy (as with some muffins I've found). And the lemony flavor was not overpowering. 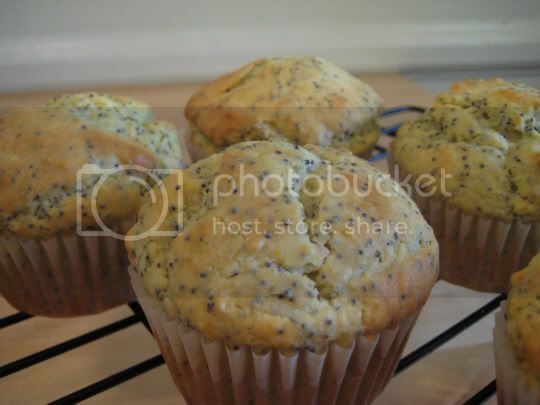 I'm not sure what the poppy seeds did for the flavor, maybe I'm just used to eating them in almond-flavored baked goods. Make again? Eh, maybe I'll try with the icing next time to add some sweetness and take away that salty flavor. I'm glad I halved the recipe. UPDATE: After eating these the next day, I have to take the rating down from 3 to 2 strawberries. These things were so salty, and definitely not sweet enough to balance it out. What's the deal?